It’s hard for Ben Hughes to meet a stranger. Originally born and raised in Sugar Land, Texas, Ben now calls Denton home. The value of relationships and their impact was ingrained in Ben at a young age. The son of a realtor and a teacher, and the middle brother of 3 kids, there was almost never a moment when the house wasn’t filled with friends, family, or new guests. He learned that building genuine relationships that last for the long haul are priceless. A hard work ethic and passion geared towards helping others were developed as he spent his college years attending Southern Methodist University for his education and participating in Fellowship of Christian Athletes, while also playing college football. 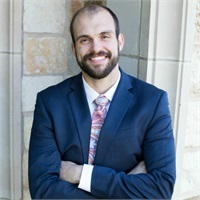 Ben pursued a position in College Ministry for two and a half years working with Denton Bible Church to minister to college students at UNT, NCTC and TWU in Denton, Texas. Ben transitioned from ministry to finance in 2017 and enjoys the relationship building that financial planning brings as well as the challenge of equipping others for financial success. When Ben is not working he enjoys reading, working out, spending time with his family, or fishing.